Well, the path back to normality has begun. 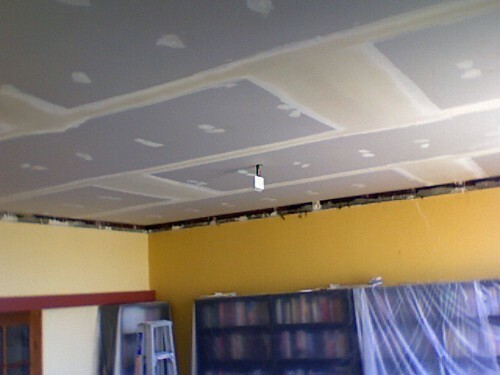 Builders began the task of putting a new living room ceiling up. They should finish tonight by adding cornices etc. Lights go back in on Thursday, and then we need to schedule painting, floor polishing and so on. Slowly, slowly. Me too. They’re pretty well sealed, though. Good work! Hope it’s not too hot in Perth! A little note to add that Gardnerspace in Locus signals a 2008 anthology unmentioned on your 2008 list (“Subterfuge” by Ian Whates at NewConPress). I know about Subterfuge. Now that 2008 is over I’m going to retire the old anthology list, rather than update it. I don’t see having the time to keep the out of date lists going, and the list is really supposed to be a working one for me so I can keep track of everything. I will get to a 2009 list – soon! It’s been a busy, busy time and so desirable but non-essential things have fallen down the list of things I’m getting to. Soon, though. As a matter of fact, your name is mentioned now at Amazon.com (with some of the authors). Jonathan: I loved your 2008 list so I made one for 2009 although it includes reprint anthologies. Hopefully it’ll make your job easier when you get around to doing yours.